“Ja, so we’ll stay in Moab for a few nights and we can do Arches and Canyonlands from there”. “Sorry what? Did you just say Moab? 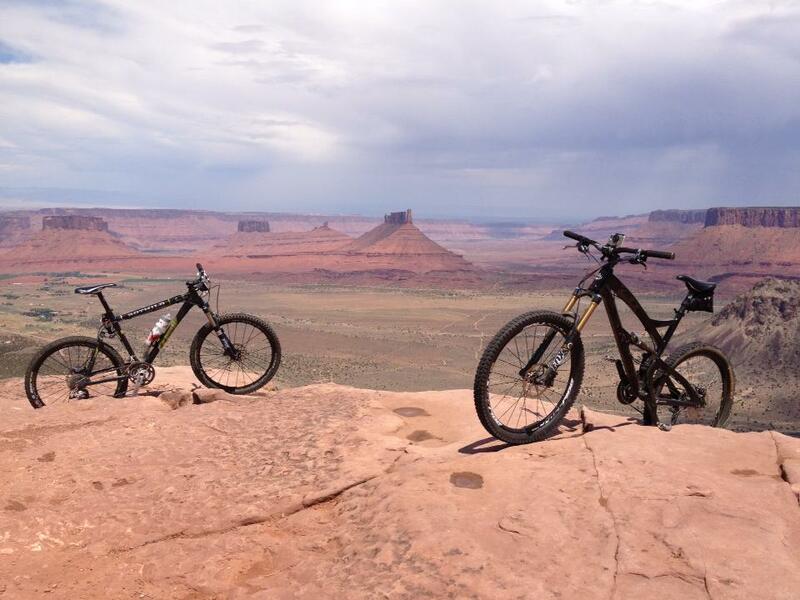 !” I got off the Skype from my brother in the States, and Googled “Slickrock trail Moab”. As a kid in the 90’s I had read about the Slickrock trail in a mountain biking magazine in CNA, when mountain biking as a sport was just gaining some momentum. I can still remember the cover photo of two riders bombing the Slickrock Trail. So when my search led me to read about The Whole Enchilada, which incorporates slickrock and more, it had to be done. We hired a Yeti trail bike from Poison Spider Bicycles, and we set off in the direction of the La Sal Mountains in the distance. After my wife, Lauren dropped Brian and me off, we hit the Burro Pass. The air is thin up there. I thought to myself, “no wonder Switzerland produces so many world class mountain bikers with all that training at high altitude!” This climb made me feel like a complete novice, and I was mildly concerned since I had been training for the 230km Trans Baviaans mountain bike marathon. A 7000 foot altitude drop through extremely varied terrain! Fortunately, we soon reached the tree-line at 11 200 feet, wished the other riders at the trail-head well, pointed our front wheels downhill and started the most epic 26 mile descent to the Colorado River just outside Moab. That is over 7000 feet of downhill mountain biking through the alpine forests, tight switchbacks, river-crossings and aspen groves of Burro, the fast flowy sections of Hazzard County, the super-quick, wide open fire roads of Kokopelli, the slickrock patches, ledges and roll-ins of UPS and LPS, the rocky roads of Porcupine Rim, with awesome views of mesas in the distance, and the exposed and narrow Porcupine Singletrack with views of the Colorado River. It took a little while to get used to the bike, but after I had figured it out, I felt a lot less like a novice, and a lot more at home bombing down a seemingly never ending downhill. The trail does flatten out in parts, and you do need to work quite a bit, but fortunately the air is less thin lower down, and the views are absolutely spectacular. The Whole Enchilada is a sensory overload – its hard to explain, but hopefully the video does it justice.